With our Bag It Forward program, you can donate your 5 cent reusable bag refund to one of three nonprofits in your New Seasons store’s neighborhood. 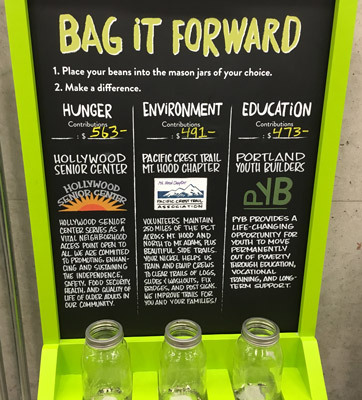 And as of October 2018, we’re expanding our Bag It Forward program to include all reusable containers! You’ll now get a 5 cent refund for things like using reusable produce bags, bringing in your own jars or containers when buying bulk, and more! You can take the credit off your total, or drop a bean in the jar to donate to one of your store’s three local non-profits. Our nonprofit beneficiaries work to end hunger, support K-12 schools and protect our environment, and each store partners with one local nonprofit from each category for the Bag It Forward program. Thanks to our generous customers, $357,440.35 has been donated to Bag it Forward partners since the beginning of the program! Want to apply to be a Bag It Forward partner? Please fill out this form and email it to donationsteam@newseasonsmarket.com.